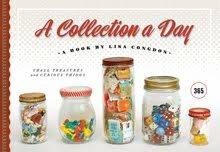 I'm also an avid collector and recently was considering stopping, but this is quite inspiring. Very nice stuff. I love it. awesome! I'm very happy that I found this site! Thank you so much for sharing! Love the cards. It might be worth noting that the card in the lower left is not correct. You can't divide 3 (or anything else for that matter) into 0. Kinda makes it even more interesting. these are great, what a wonderful blog concept. This is a great blog -- I love both the layout of the photos and their content. As a math teacher, though, I feel compelled to respond to Josh's comment. Of course you can divide nonzero numbers into zero! What you can't do is divide by zero. 0/3 is like saying a cake is divided into three pieces and you have none of them. That problem says 3/0, not 0/3. It is absolutely incorrect. I found a set that my wife had purchased (from EduPress) that had the error you mention...even stated that 0/0=0!!!! 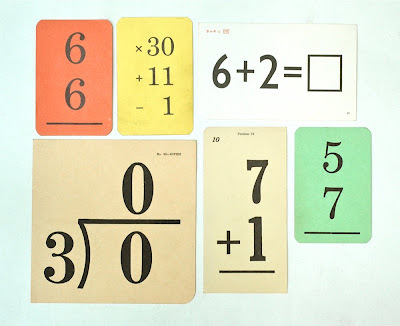 really cool Vintage math flashcards, that is a great job. My son is having problems with maths and I will use flashcards like those to try to help him remember the equations and mathematical concepts, thanks!